Have you ever had one of those projects? The kind you thought was going to be an absolute breeze? That you left till the last minute because you thought it’d take a day at most to piece? The one you never realised you could be so wrong about? That you ended up cursing out and wanting to rip apart with your bare hands in frustration? 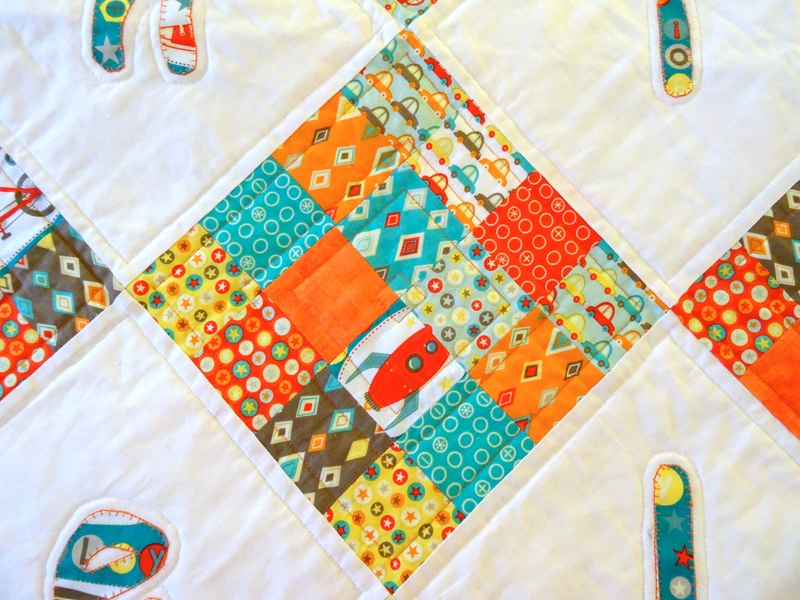 The project that, once finished, you took such deep satisfaction at managing to overcome all the issues that the Quilt Gods threw at you, that it actually seemed worth all the Very Bad Words that were uttered during its construction? It all started out innocently enough, with some Very Good News. My lovely schoolfriend, Ms S, and her husband, Mr M, announced last year that they were expecting a baby boy. 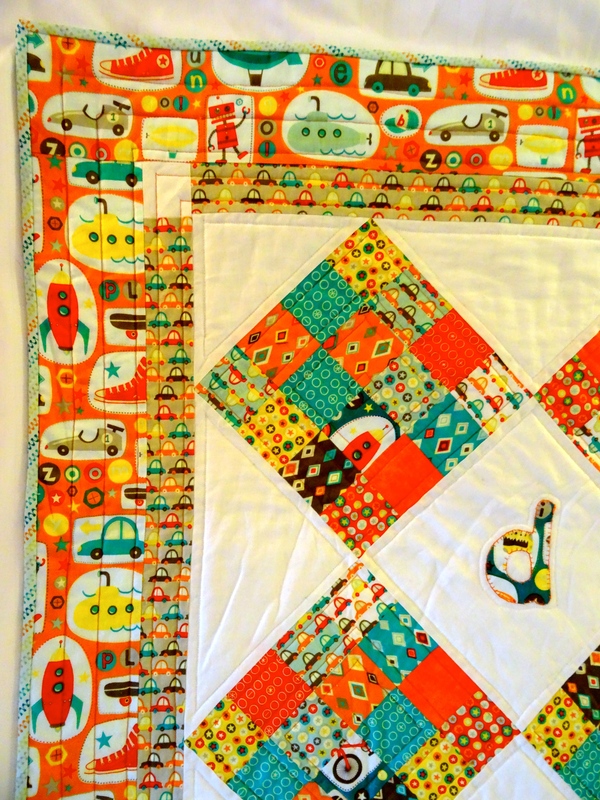 I was so happy for them, as I knew how much they’d been looking forward to becoming parents, and I immediately decided that the new arrival would need a quilt. Now Ms S is an exceedingly talented lady. Not only is she pretty and kind and a complete brain-box, she is also extremely crafty. 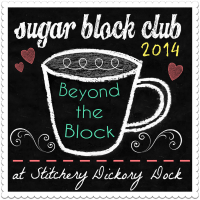 She creates, sews, crochets, bakes a mean chocolate muffin, and even has her own Etsy shop. I am in total awe of her! So the quilt needed to be super special. And when we were in the US back around Thanksgiving, I found just the thing, handily bundled together as a super-cute kit. 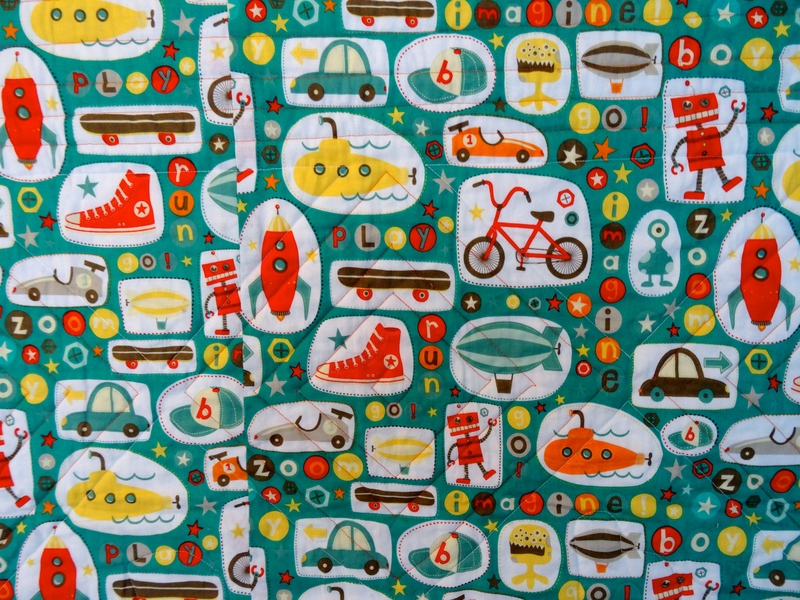 The fabric range was Boy Crazy from Riley Blake Designs, and included cars and robots and space rockets, and lots of other things that little boys like to play with. The pattern seemed deceptively easy. It consisted of 12 scrappy 16-patch blocks, set on point, alternated with plain white squares, and a couple of directional borders. I know, sounds like a walk in the park, doesn’t it??! But one word in the last paragraph would come back to haunt me. And that word is ‘directional’… Given some of my previous experiences with directional fabric, you might think that warning bells would sound at this point, but no. All I thought was – oh how pretty, the little cars are all driving in the same direction! The first issue I encountered had nothing at all to do with directional fabric, though. 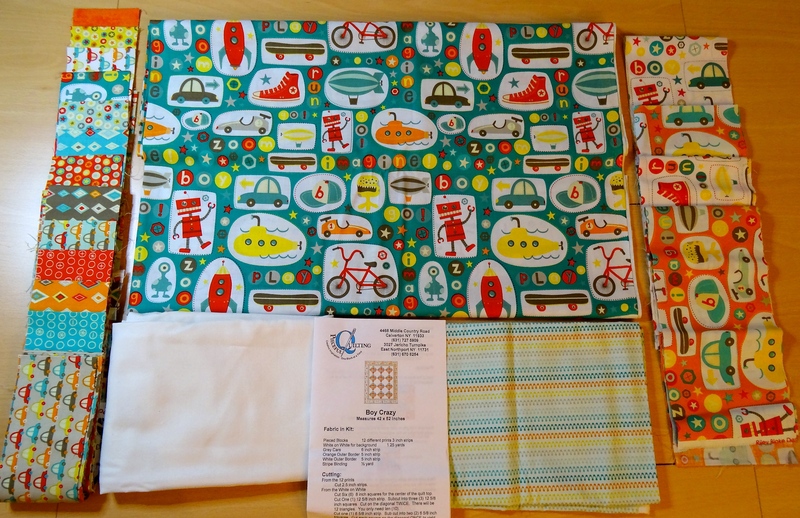 It was an error in the pattern itself, which called for the white fabric to be cut into 8″ squares. While I was cutting them, I remember thinking “Gosh, 8″ is a funny size for setting squares – wouldn’t it usually be either 7 1/2″ or 8 1/2″‘?” but I foolishly ignored the Inner Voice of Reason and continued cutting happily away. It was only once I’d made the 16 patch blocks that I realised that – yes – the finished block size was indeed 8 1/2″ square. So my setting squares were too small. So I had to recut them. And I didn’t have quite enough fabric. A small annoyance, easily rectified with a visit to my stash to retrieve some Kona white. 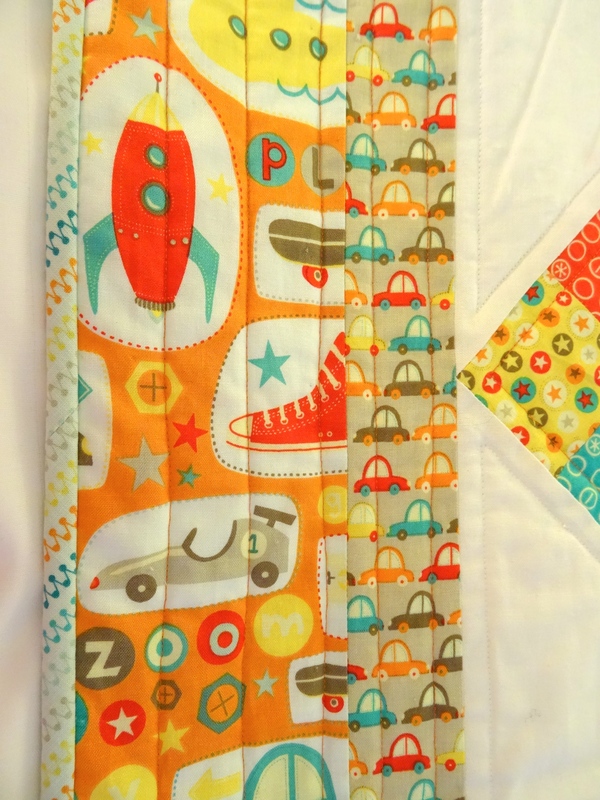 Then the directionality of fabric came into play. After some Very Creative Pressing, Plenty of Pinning to ease the fabric of the quilt top, and Lots of Words Beginning with ‘F’, I managed to get the first border to just about fit. Next up – border 2. And the same problem reared its ugly head. The border was once again directional, and once again there wasn’t enough fabric. Well, this time there was more than enough for the top and bottom borders but, unfortunately, not quite enough for the sides. So, to make it fit, I had to piece it, by cutting into the surplus from the top and bottom. Fortunately, there was just enough left over. Ok then, quilt top pieced, issues overcome. Now for the backing. A beautiful piece of large scale directional fabric. So out came the rotary cutter and I chopped up my 3 yards of fabric into smaller pieces, which I then proceeded to sew back together, to make a hodgepodge of a backing that just managed to fit. Perhaps hodgepodge is a little harsh. Let’s call it improvisational, shall we??? After all that, the actual quilting was a piece of cake. 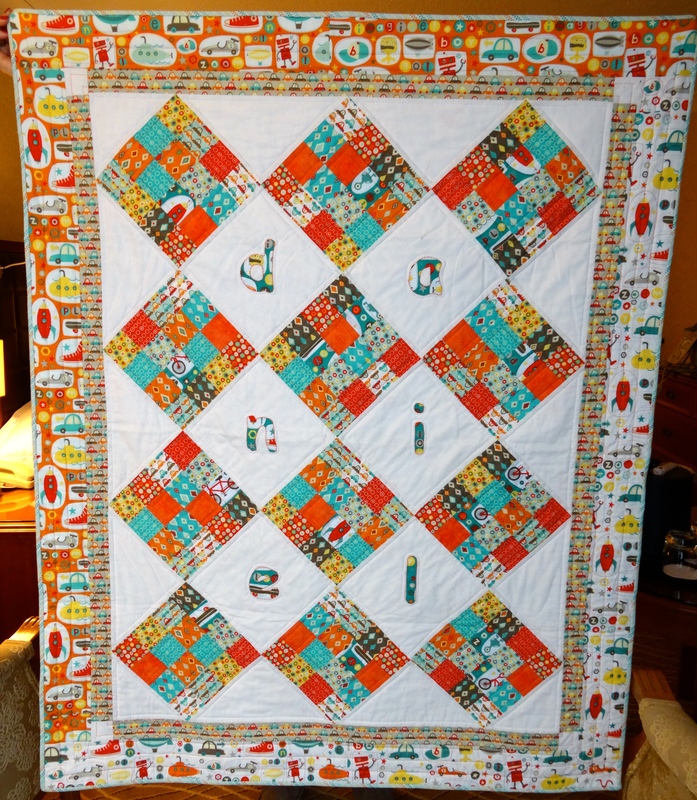 I used white thread to echo quilt the appliquéd letters and the edge of the setting blocks. 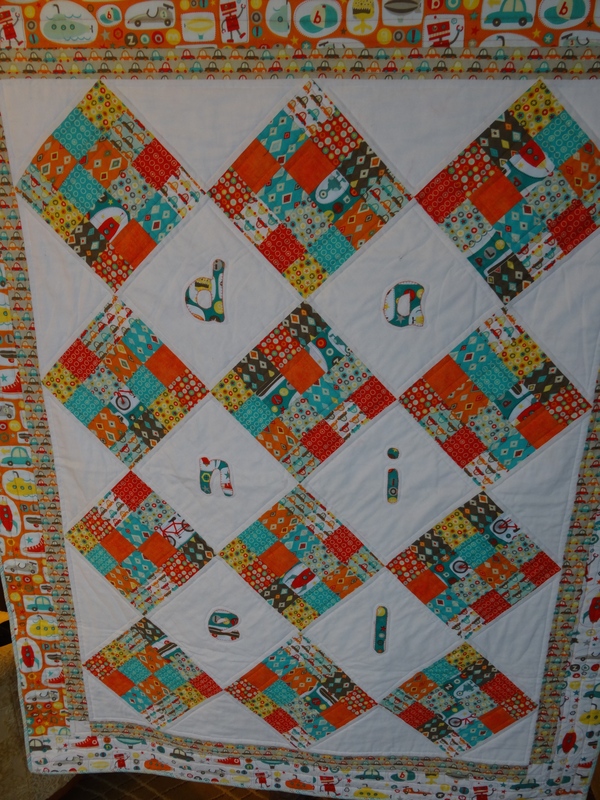 Then I quilted concentric squares in the 16 patch blocks, using a vivid orange colour to co-ordinate with all the bright colours in the prints. 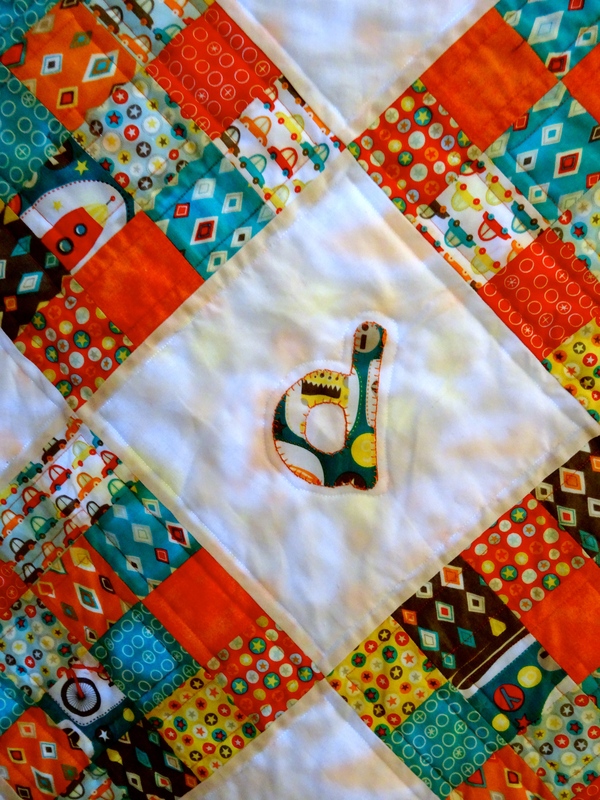 Finally, I quilted parallel straight lines around both borders, again in orange. To finish the quilt, I decided to use a bias binding, to make my stripes appear diagonal. I’d never done it before, but my friend Ms E has used it on her quilts and talked me through how to do it at the last Patchwork in the Peaks quilt retreat. I thought it looked beautiful and had been wanting to give it a try for ages. And anyway, I figured, what else could possibly go wrong??? 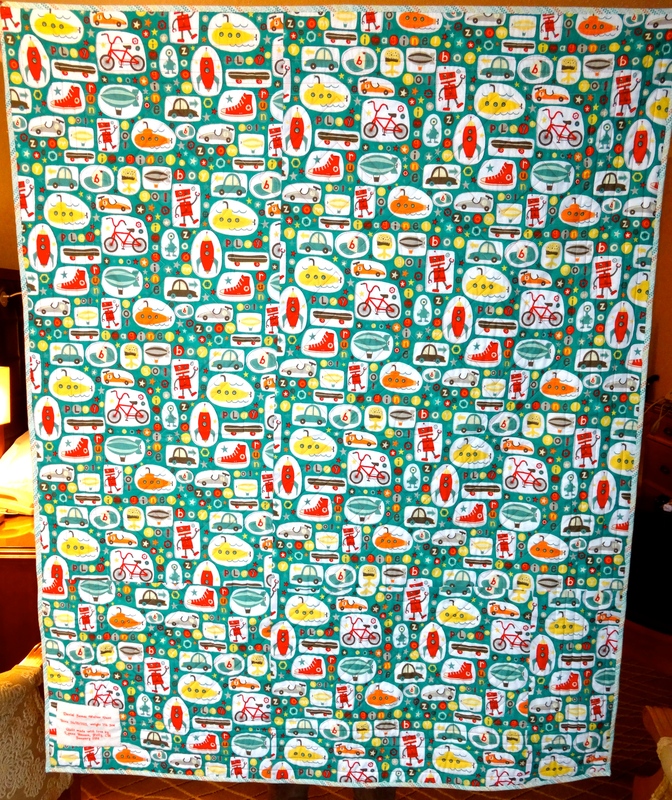 Some more creative cutting and piecing just about salvaged the situation (along with a stiff gin and tonic…). And the quilt was finally finished. Ta da!!! Looking back, though, I have to say I’m rather proud of myself. 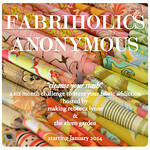 Normally when things go wrong I would simply go and get some more fabric to put them right. But I’m on my 6 month Fabric Fast, so that wasn’t an option. I was forced to think creatively about how to get round the issues. And no, the quilt isn’t 100% perfect, there are seams where I’d prefer there to be no seams, and a slight puckering in the corners, amongst other things, but you know what? It was a labour of love, and I think that makes it more personal. 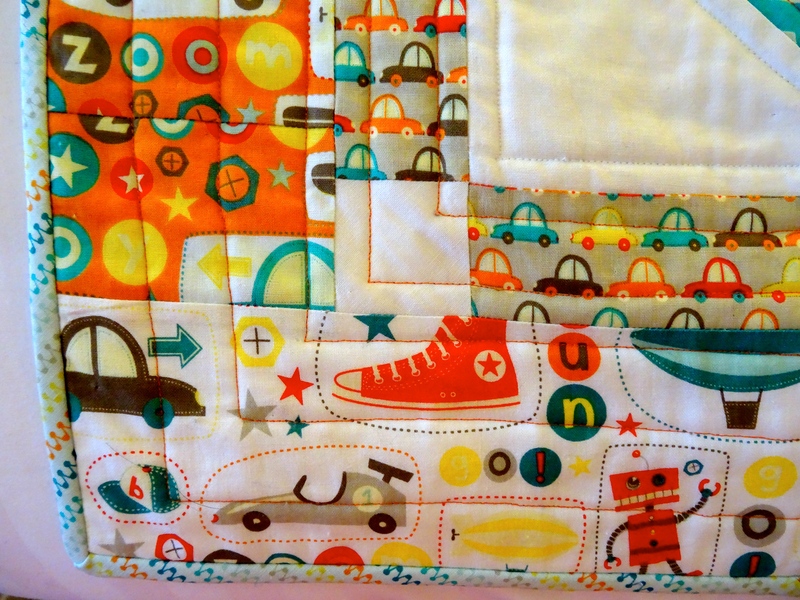 After all, there can’t be many babies out there who have the honour of owning The Quilt from Hell! Phew. I need a lie down after reading all about TQFH. Well done for overcoming Sooooo many obstacles. I think if it had been a project of mine it would have been locked in the naughty cupboard for a few weeks!! No one would ever know that quilt had given you a lick of trouble by looking at it. I admire your perseverance. Tu devrais écrire un livre… Réellement! Ton cadeau final est superbe et Daniel sera certainement bien au chaud avec tous tes efforts! Seriously fabulous and worth the hair pulling craziness. Great job.